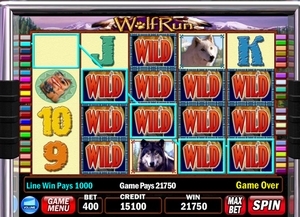 The wild symbol is a more than welcome sight when you are playing a slot game. The reels are spinning and it’s beginning to look as if you won’t be getting any winning combination. However, the wild symbol can come to your rescue. It may not be able to produce three matching symbols in its own right (though it tends to pay out a decent win if it does), but it can substitute for other symbols in the game. As a result, some winning combinations can come your way and all’s well that ends well. What is a Stacked Wild? Just by itself though, the wild symbol can sometimes feel a little bit lonely and might only produce one winning combination, but in some games there are stacked wilds and this feature can really start racking up some good wins. It’s a bit like waiting for a bus at times, you wait ages for one to turn up and then a whole lot of them turn up at the same time. A stacked wild can be used in a variety of ways. For example, there may be several of them stacked together. Depending of course on how many rows of symbols there are in a particular game, they can result in a whole reel being filled by three, four of five wild symbols. This can result in some excellent wins for the player. In some games there’s even the possibility that you can get stacked wilds on each of the reels but more commonly they only appear on selected reels. The Christmas themed game ‘Deck The Halls’ really does give you lots of presents. The Christmas bells are the wild in this game and they are stacked during the free spins game. Even better, they pay 4x the win. Another bonus in the game is that the Santa symbol is also stacked during the bonus game, well Santa does come down a chimney stack doesn’t he? Stacked Wilds can play an important part in bonus games especially those that feature free spins. The combination of some stacked wilds which could be producing constant winnings that are subject to a multiplier, can result in a very lucrative bonus game. When you see that there are stacked wilds in a game that often means that the game will be more volatile so look out for those big wins. In the ‘Dungeons and Dragons’ slot game from IGT, there are stacked wilds available in the bonus game and they can be found on each of the reels. It’s important that you check the paytable before you start playing the game. That way you know exactly how the game operates and just how the stacked wilds work. Stacked wilds really can be a useful feature in a slot game. They cover wider areas thus increasing your chances of getting winning combinations.